A few weeks ago I set out on a new series of articles through which I intend to scan the history of the church—from its earliest days all the way to the present time—to examine some of Christianity’s most notorious false teachers. Along the way we will visit such figures as Arius, Pelagius, Fosdick, and even a few you might find on television today. We continue this morning with a false teacher whose name has been nearly forgotten even though his followers regularly knock on your door. 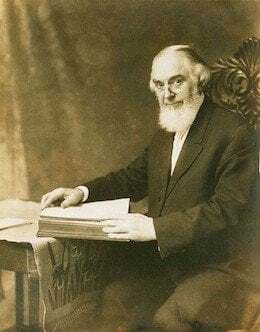 He is Charles Taze Russell, founder of the Jehovah’s Witnesses. Charles Taze Russell was born on February 16, 1852 in Allegheny, Pennsylvania, the second of five children born to Joseph and Ann Russell. Charles grew up in a devout home and his parents were respected members of the Presbyterian church. When he was young, his family moved to Pittsburgh, where his father came to own a number of haberdashery stores. In his early teens Charles became a partner in this business and soon owned several of the locations. As a boy Charles had a great deal of religious enthusiasm, and while still only a teenager left his Presbyterian congregation to attend a Congregational church. As a form of evangelism he would often go to public locations and use chalk to write out Bible verses related to sin and damnation. But then, at the age of sixteen, he engaged in a debate with a friend that led him to question the reliability of the Bible and the validity of the Christian faith. He embarked on a period of religious searching and dabbled in many Eastern religions before determining that they, too, were empty and unsatisfying. When Charles was eighteen he encountered Adventist preaching and began to regularly attend a Bible study. It was not long before he determined that he could not reconcile an eternal hell with a merciful God. Over the next two years he came to question many other historic Christian doctrines and became convinced that the historic creeds betrayed true Christianity. At the same time he adopted Adventist teachings: that the end times had begun in 1799, that Christ had returned invisibly in 1874 and been crowned King of Heaven four years later, that all Christians who had already died would be resurrected before the end of 1878, and that 1914 would mark the end of a harvest period and usher in Armageddon. He sold his five clothing stores, an act that generated a substantial amount of money (today’s equivalent of several million dollars), and committed his life to writing, publishing, and funding the propagation of the message of Christ’s imminent return. He did this at first through a partnership with Nelson H. Barbour and his Adventist periodical Herald of the Morning. When 1878 came and went without any of the predicted events, he was forced to re-examine his beliefs and to distance himself from some of his Adventist peers, including Barbour. He founded his own periodical which he titled Zion’s Watch Tower and Herald of Christ’s Presence. At this time he also married Maria Frances Ackley in an apparently celibate union that would last until 1897 before ending in an acrimonious divorce. In 1881 Russell founded the Watch Tower Bible and Tract Society which grew to a substantial publishing venture, and there were soon some 16 million of his books and booklets in print. His ministry and his opportunities to preach grew exponentially and Pastor Russell, as he became known, soon had followers all over the Northern and Eastern states. He preached and wrote constantly, his sermons were printed in several thousand newspapers around the globe, and he became one of the most famous preachers in the world. He eventually moved the headquarters of the Watch Tower Society to Brooklyn, New York, where they remain today. Russell died of cystitis on October 31, 1916, near Pampa, TX, as he attempted to return to his home in Brooklyn. By the time of his death, his writings had become among the most widely-distributed works in the world. Some estimate that when he died, only the Bible and the Chinese almanac were in greater circulation than his myriad books and pamphlets. Unlike so many other false teachers before and after him, Russell did not rely upon visions or other extra-biblical revelation. Rather, he simply interpreted, and misinterpreted, the Bible. While claiming to be a Christian and, in fact, a Christian who was restoring the faith of the New Testament, he denied many key Christian doctrines including eternal punishment, the Trinity, the deity of Christ, and the existence of the Holy Spirit. Russell, as with most Adventists, denied the existence of hell as a place where the wicked face God’s wrath. He also held that the soul simply ceases to exist after death. As with Arius centuries before, he held that Jesus was a created being, and was actually Michael the Archangel in human form. While he taught that this Jesus died on behalf of humanity, he also taught that Jesus rose only spiritually rather than physically. While he denied the divinity of Jesus, he denied the existence of the Holy Spirit, teaching that the Spirit is not a person, but simply a name given to express a specific manifestation of God’s power. In denying the divinity of Jesus and the existence of the Holy Spirit, he necessarily denied the Trinity. Those who followed Russell during his lifetime referred to themselves as Bible Students. In the years following his death, Joseph Franklin Rutherford succeeded him as president of the Watch Tower Society. Despite many people withdrawing from the Bible Study movement, and despite those who remained splitting many times over, Rutherford’s followers maintained control of the Watch Tower Society and officially renamed themselves Jehovah’s witnesses in July 1931. The Watch Tower Society remains the official religious body of the Jehovah’s Witnesses. Though both their beliefs and their structure have evolved in the past century, they continue to state that there is one God in one person, that there is no Trinity, that Jesus was God’s first created being, that the Holy Spirit is an impersonal force, and that there is no hell. While Russell is honored among Jehovah’s Witnesses, they do not refer to him as their founder. Rather, they hold that Jesus is their founder while Russell was simply a man used by God to restore beliefs that had been lost. Today there are some 8 million Jehovah’s Witnesses in the world. The Bible teaches clearly, forcefully, and repeatedly that hell is real and that in hell God’s wrath is poured out upon the wicked in conscious, eternal punishment (see, for example, the bottom of the previous post in this series). That the Holy Spirit is a person rather than an impersonal force or manifestation of the power of God is attested in many passages that refer to the Trinitarian formula of Father, Son, and Holy Spirit. A host of verses speak to his personhood, including Romans 8:11, “If the Spirit of him who raised Jesus from the dead dwells in you, he who raised Christ Jesus from the dead will also give life to your mortal bodies through his Spirit who dwells in you.” The Spirit is a person who can teach, be grieved, be resisted, speak, help, and so much more besides.